Nature is the backdrop for your ceremonies, creating a truly amazing and one of a kind experience. Picture yourself walking down the center aisle beneath a ceiling of hand painted tiles in a replica of a 17th century Roman chapel. Imagine saying, “I do”… in the middle of a butterfly-filled botanical garden, or in a cloud forest under an ¨avatar¨ tree. You might want to exchange your vows cradled beneath an atrium jungle canopy, or on the golden sands of the Pacific Ocean. Perhaps you can see yourselves in a country village setting, or at the foot of waterfalls in a private, rural mountain retreat. As part of your wedding, we contribute to the health of the planet by adopting trees for carbon offsets. 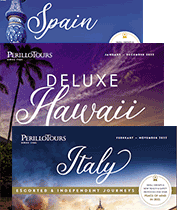 The dedicated planners at Perillo can personalize these stunning locales to your exacting standards while meeting your budget. Beautiful weddings involve orchestrating a series of magical moments, and connecting them all to create a precious and unforgettable experience for you, your families, and your guests. The natural wonder of Costa Rica make this amazing, environmentally conscious country one of the world’s most cherished locations for destination weddings. For your backdrop - there’s the acres of green rolling hills and dairy pastures, along with 2,000 pristine acres of the private nature reserve that surrounds the property and its beautifully manicured botanical gardens. The soothing mist and pure mountain add to the melodies of countless species of tropical birds combine for the perfect natural soundtrack. Cloud Forest Hotel & Nature Reserve: Villa Blanca is located in the Central Valley in the highlands above San Ramon, the city of poets, includes the Mariana Chapel, built by former President Rodrigo Carazo as a gift to celebrate the 50th wedding anniversary to First Lady Estrella Zeledon. The chapel overlooks a 19th century village concept whose serene setting, including the Avatar Tree Terrace, makes Villa Blanca a dream-like destination for weddings, honeymoons, and milestone events such as family reunions, vow renewals and other celebrations. A life spring of flora and fauna is yours to explore in this mesmerizing world of mist, mountains, and the magic of nature surrounding each private garden suite, with Spa amenities and El Sendero Restaurant overlooking 2,000 acres of pristine tropical cloud forests with the backdrop of Arenal Volcano. On the West Wing of Si Como No Resort, overlooking the lush jungle terraces of the Manuel Antonio coastline is the jungle garden terrace of El Rancho Con Mucho Gusto. For a private Wedding Elopement Ceremony to a wedding party of up to 70 guests, this covered venue can serve for your sunset wedding ceremony as well as wedding reception. With the adjacent Adult Pool and Bar Mogotes, you can create an entire event, from ceremony, cocktails poolside, and a sit down 5-course dinner with entertainment in one ideal and convenient resort venue to even customize your wedding theme. Manuel Antonio National Park: Perched on the lush jungle terraces overlooking Manuel Antonio National Park. Si Como No continues to be a stellar example of global eco-tourism, having set the region’s standards from the day it opened 20 years ago. The area’s incredible bio-diversity and deeply rooted cultural values of the Costa Rican people are brought to life in the custom weddings and honeymoons created in this very special part of the Pacific Coast. With its barefoot luxury and pura vida vibe, the resort simply delights couples and wedding guests with its comfort, convenience, and commitment to the sustainable hospitality. Everyone will enjoy nature exhibits and tours of the Butterfly Botanical Gardens, Crocodile Lagoons, Nocturnal Amphibian Gardens. the Santa Juana Rural Mountain Adventure. In Santa Juana, couples can add to over 10,000 indigenous trees planted through our Tree Adoption Certificates, the perfect way to have new names and new lives together preserved for future generations. Casual and elegant, the natural seascape envelops you with beauty, romance and wonder, setting the tone as you embark on your mystical union. Choose your wedding theme on the beautiful beaches of Manuel Antonio where the lush tropical jungle meets the golden sand beaches and warm Pacific Ocean 365 days of the year. For couples eloping, or with family and friends up to 70 invited guests, we can help you design a wedding experience to fit your budget and taste. Notary Services & Officiant for Ceremony. Complementary Welcome Cocktail Upon Arrival. The languages of peace and tranquility are spoken in the mountains of Santa Juana, Costa Rica.. Alive-In the pure energy of nature, in the blissful scent of the regions native flowers, mystical waterfall and the hum of the birds and butterflies which live in Zen unison with all people who enter this sacred land. “Aqui No Mas”, translated means, “you need not travel further.” You’ve arrived in a place where your outer journey will take you inward, towards self. Tree adoption site fee (50 trees will be planted under the name of the bride and groom ceremony.